A great and fun way to support rewilding is to go and see it in real life! For every day that passes there are now more and more nature and wildlife safari opportunities in Europe. You can travel around on your own, by bike or car and with map or gps in hand. Or maybe use some assistance to more easily get to the best spots, the most charismatic wildlife and the most interesting people. Wildlife watching in the Orfento valley in the Majella NP. Abruzzo, Central Apennines, Italy. We are working on presenting lots of travel facts, tips, readily bookable products and other opportunities for this, with a clear focus on our rewilding areas. Over the last months, we have showcased several nature safari operators and tourism products on this site. Products that are already available in Europe, especially in our rewilding areas. we focus on bookable products, from tours to lodges, hotels and B&B’s. The first travel offers to our rewilding areas are already up there, from: the Danube Delta, Velebit, Western Iberia, the Central Apennines and the Southern Carpathians: https://rewildingeurope.com/safaris/. Most of these prepared travel itineraries can of course also be adjusted and tailored to your and your family’s taste. We are also putting in a lot of effort into expanding the selection here. Check it out every now and then, and you will see. we focus on describing the rewilding areas as travel destinations, soon with pretty much all info that you might need in order to take a decision to go there. What attractions are here to see? When? How to get there? How to get around? Where to visit? Where to stay? You are very welcome to become a member in the Club. Members regularly get special offers on tour products and also have the chance to win one of the fantastic tours that are then provided to them at no cost, following draws within the membership, three times per year. 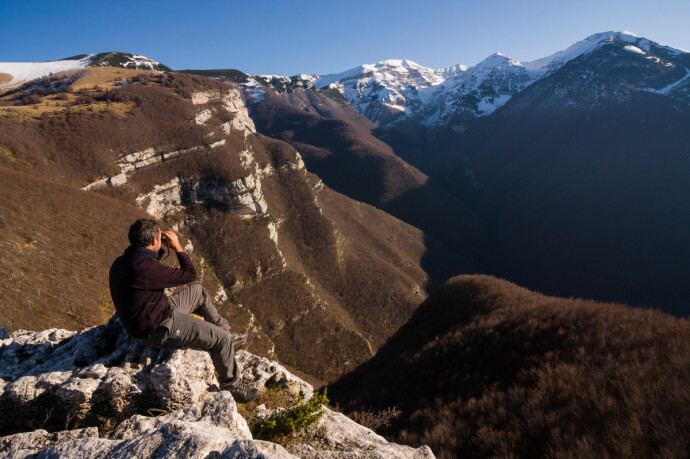 Right now, A Rewilding Bison trip to the Tarcu Mountains Reserve is on draw, and so is an adventure in the Abruzzi, in the Central Apennines, also called Italy’s wild heart. The next draw is planned at the end of July. See here information about the three trips in the draw. For Travel Club members we are preparing the following draw in December, and providing special offers already before that. In next draw are tour products like Birdwatching in Southern Portugal in September. You can book it with a unique code in the newsletter we are issuing to the members of the Travel Club. Still not a member? Here we go: https://rewildingeurope.com/travel-club/join-the-travel-club/. And please remain assured that looking forward, there will be many more travel arrangements on offer to our rewilding areas and to Europe’s Top wildlife destinations.